SCVHistory.com LW2740 | San Francisquito Canyon | Major Gordon's / Widow Smith's / Delano Station: An Alternate Theory, 1942. 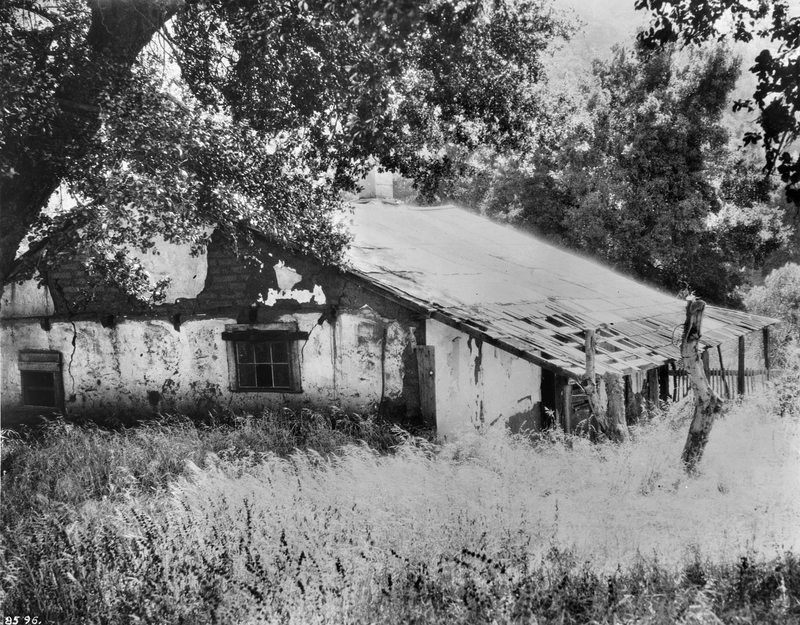 Major Gordon's Station (aka Widow Smith's, aka Delano), seen here in 1942, was located at today's 38839 San Francisquito Canyon Road, just southwest of Green Valley. It was razed in the 1960s. Written by persons unknown, the text accompanying this photograph and two others in the California Historical Society Collection deviates significantly from the standard version. Also, the idea of six old adobe stage stations in San Francisquito Canyon being destroyed in the 1928 St. Francis Dam Disaster is something we can't substantiate. The adobe was built by Marta Caravajales and Juan Celis. Later it was used by Major Ben Gorman as a stop on a stage line he operated between Los Angeles and the Mojave and Willow Springs mines in the early 1870s. The adobe was probably built around 1856 to 1858. It escaped destruction by the 1927 San Francis Dam disaster, being above it. — unknown author. Photoprint reads: San Francisquito Canyon. The building of this one is credited to Marta Caravajales and Juan Celis. No date is given. It was one of seven adobes in the canyon, six of them were destroyed by the St. Francis Dam flood in 1927. This one escaped, being above the dam. The 1929 annual publication of the Historical Society has a picture of this building marked "Major Gorman's Stage post." This was Ben Gorman who operated a stage line between Los Angeles and the Mojave and Willow Springs mines in the early 1870's until the Southern Pacific Railroad came in 1876. It was quite likely that this was a stopping place. My idea about the date of this building is that all the adobes in the canyon were built about 1856-8 when the county built the road through here. — unknown author. LW2740: 19200 dpi jpeg from digital reproduction | California Historical Society Collection at University of Southern California, Catalog No. CHS-8596.